A bill before a joint Massachusetts Legislature committee today would throw out the state’s auto damage appraiser licensing board and rules regarding appraisers in the state. Since nothing else would replace these, based on the bill language, we appear to be talking about a situation where insurers could hire any warm body to start appraising cars without any oversight or profession regulation. Amazingly, this not only has a sponsor, Rep. Brian Ashe, D-Longmeadow, but two co-sponsors: Reps. Leonard Mirra, R-West Newbury, and Chris Walsh, D-Framingham. The bill title calls it “reforming” the appraisal process. 8G creates the Automobile Damage Appraiser Licensing Board and other rules regarding appraisers and their licensing. Take a good look at the current language — it might not be around much longer. Tough insurance changes for drivers, auto body shops could come in Mass. 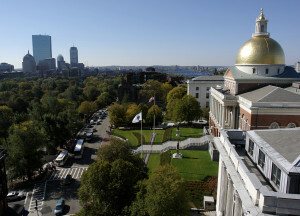 The Massachusetts Alliance of Automotive Service Professionals will be attending the hearing to talk about its House Bill 857, Executive Director Jillian Zywien wrote in an email. Presumably, they’ll be opposing the ADALB bill, as they’re supporting another ADALB reform bill, HB 816, which would change the makeup of the board itself. That bill isn’t yet scheduled for a hearing as far as we can tell. As for HB 857, it twice stresses to consumers their right to pick their own auto body shop. HB 857 also tweaks the language (and increases its point size) on estimates with non-OEM parts. That message would continue with the the shop choice wording described above. Zywien seemed to indicate the Joint Committee on Consumer Protection and Professional Licensure meeting Tuesday at 1 p.m., might be worth a look too. The main event there for collision repairers and auto insurers likely is HB 3810. It appears to be a rival to HB 857, as it tells consumers that non-OEM parts probably won’t void warranties due to the Magnuson-Moss Warranty Act. Be heard: Massachusetts legislature contact information can be found here.